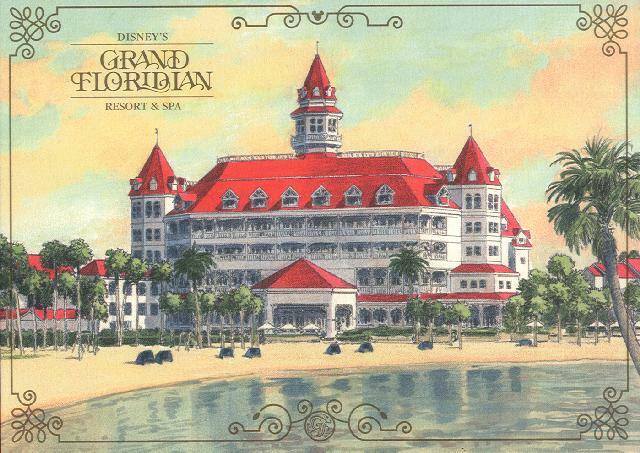 Originally named Grand Floridian Beach Resort this elegant, Victorian styled, hotel was the first hotel to open on the Monorail line since the Grand opening of the Contemporary and Polynesian resorts back in 1971 (and for that matter the only other resort to ever open on the monorail line), it was also aimed squarely at the high-end consumer with elegance being a keyword in anything they do there are three fine-dining establishments at this resort in addition to a buffet, a counter service and three lounges (Disney speak for bars). It has a five-story lobby with stained glass domes in the ceiling and Chandeliers, a Grand piano sits in the center of the lobby and a Jazz orchestra plays on the second level of the lobby in the evenings (alternating sets with the Grand Pianist in the center on the lobby) from 4 to 10 PM. There is a Grand Staircase to the second level with it's steps flanking an open-cage elevator. In addition to the rooms of the main building there are several surrounding buildings built in the same elegant Victorian style giving this resort a total of over 800 rooms, additionally there is a convention center that opened in 1992 and the name was changed to the current one in 1997 (Disney A to Z 2nd ed). ... This one however has a 1991 The Walt Disney Company copyright now although that is a later Copyright than the double wide linen card I suspect that they may have been given away at the same time because that linen card also shows up in much later versions including ones printed AFTER the resort changed names in 1997. 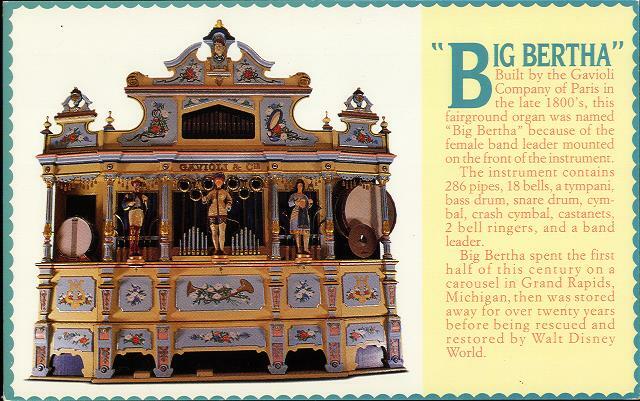 Which makes me wonder if perhaps this card, of the Band organ that is found in the 1900 Park Faire Character buffet restaurant, was perhaps given away at the restaurant rather than in the rooms. 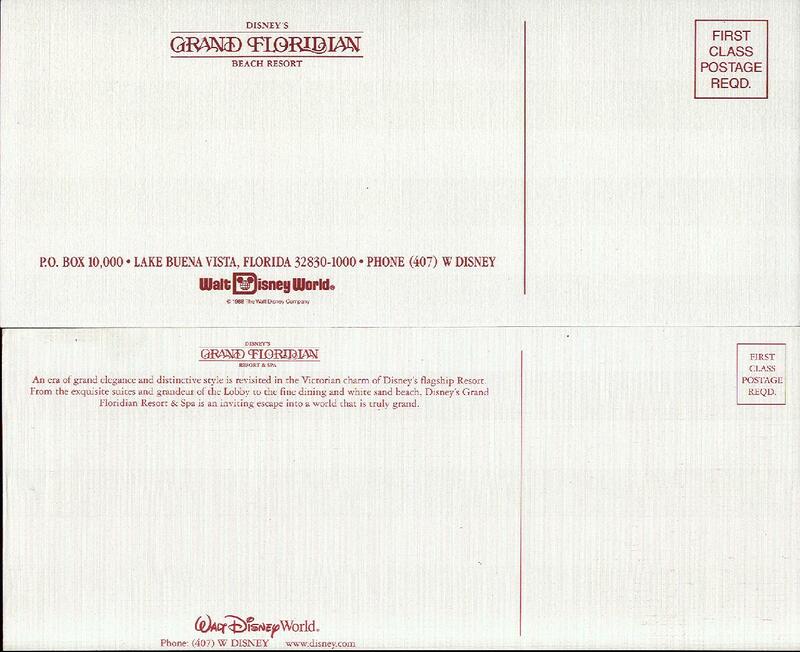 Above: the backs of both of the printings of the double wide view of the Grand Floridian resort both with the original name and 1988 copyright and in the later name with the Disney.com address and newer version of the Walt Disney World logo. As the MOST Deluxe of all the Deluxe resorts the grand Floridian has continued to have these "free with stay" long after many other resorts (especially the value and moderates) had cut them out as a way to control costs. 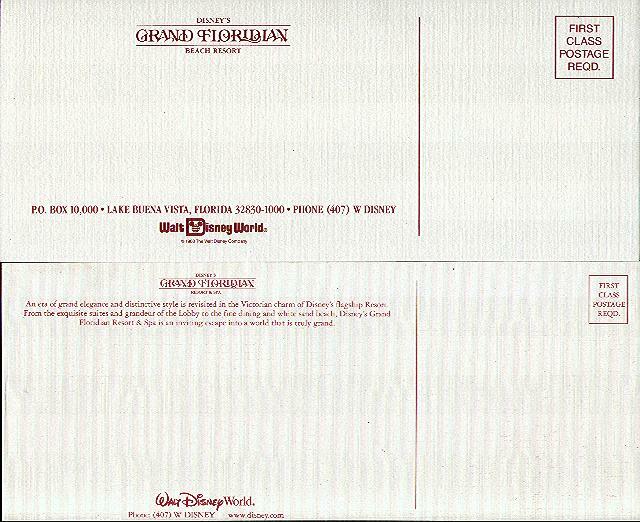 I suspect that the first of these two was released around the year 2000, the second card below has a 2002 number as a part of it's stock number I belive that was the date of it's initial printing, after that it has an 11/04 marking which I suspect is the printing of the particular batch of cards (for us collectors it would be fantastic if this had been done this way much more often over the years). 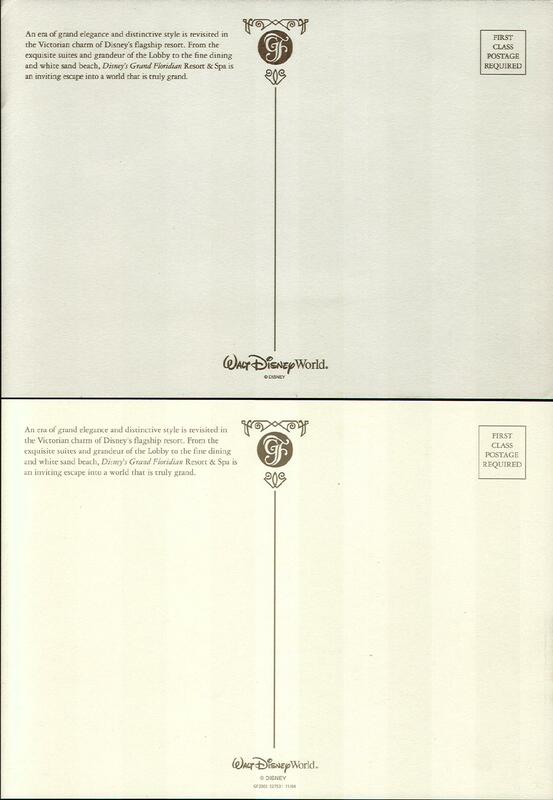 Additionally these cards have a Grand Floridian Logo on the back and a mostly consistent style from one to the other so I'll include an image of their backs as well. 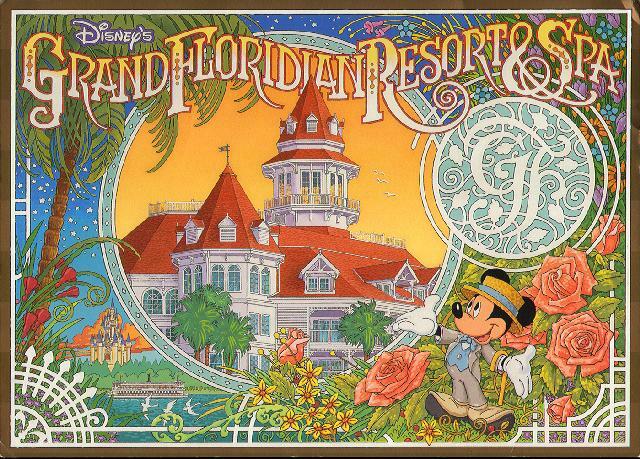 At the same time Disney was aiming for a more upscale clientele than they ever had before with the Grand Floridian, they also decided there was another market niche they had neglected as well and so they opened what was at the time called the first "value" resort, and October 1, 1989 Disney's Caribbean Beach Resort opened, although it has had many postcards over the years including a set of several cards sold in a packet, I don't personally have ANY examples of "free with stay" type cards from this resort, that said I suspect that there are some in existence just because all subsequent resorts prior to the opening of Pop Century had a free with stay card at one time or another, so I suspect that I just haven't found a card of this type for this resort yet. If I do find some "free with stay" cards for this resort I'll move it to its own page.